San Diego's shifting real-estate market could mean new opportunities for entry level homebuyers. 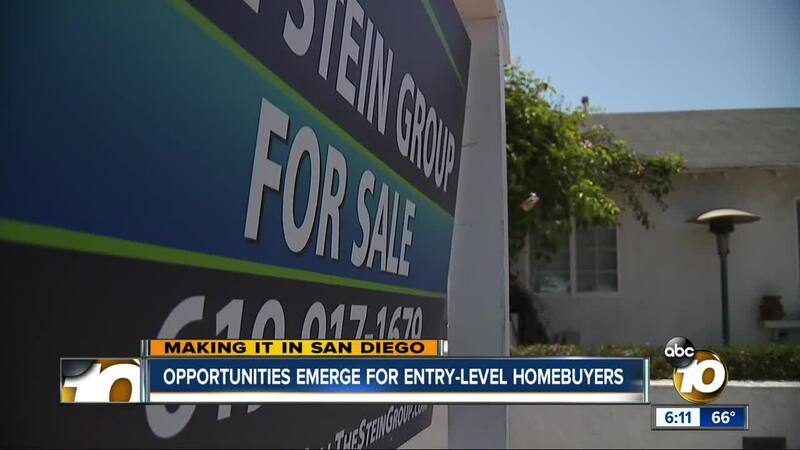 SAN DIEGO (KGTV) — San Diego's shifting real-estate market could mean new opportunities for entry-level home buyers. A new study from realestate.com says the rate of appreciation for homes at the lower third of the price range are appreciating at 2.2 percent annually. That's a large drop off from the 10.4 percent price growth those homes saw from 2017 to 2018. The typical entry level home in San Diego County is now worth $424,500. That's still a hefty price for San Diego renters who are paying an average of about $2,000 a month and struggling to save for a down payment. Still, down payment assistance programs are available through the County and San Diego Housing Commission . Additionally, potential buyers can qualify for an F.H.A. loan with as little as 3.5 percent down. And Veterans can buy homes with nothing down through a V.A. loan . Carlos Espinoza and his wife Esther are buying a two-bedroom condo in Rancho Penasquitos for $399,000, the full asking price. They put 12 percent down, which they accumulated by increasing contributions to Carlos's 401(K), then borrowing from that fund . "Save as much as you can, even though sometimes you may feel like it's not enough," Carlos said. "The American Dream is alive again." Rich Kushner, a realtor with Burke Real Estate Consultants, said the most important thing an entry level buyer can do is get pre-approved for a loan. That will cause a seller to take an offer more seriously. "Everything's negotiable when you write a contract, but you're going to have a stronger offer if you have a pre-approval letter," Kushner said. Realestate.com says inventory of entry level homes is up 21 percent annually in San Diego. Both Zillow and Bankrate listed San Diego as one of the nation's most challenging housing markets for first-time buyers.